All the services available under globalization standards our excellence center is designed to meet all your needs. Vejthani Hospital, established in 1994, is one of the leading private international hospitals in Thailand that provides JCI accredited quaternary health care services. Cutting-edge medical technologies, internationally trained specialists, world-class health care standards and authentic Thai hospitality are our key competencies. Visit our Bangkok hospital for medical check ups and other procedures. Serving over 300,000 patients from over 100 countries annually with over 200 inpatient beds, the hospital provides a team of knowledgeable translators able to communicate effectively in over 20 languages to ensure that there are no issues with regards to communication when it comes to healthcare. Over 300 specialists across multiple specialties at Vejthani Hospital, we provide a comprehensive range of quaternary medical services including bone marrow transplant, robotic spinal surgeries, total joint replacement surgery, kidney transplant, plastic surgery, dental, skin & laser treatment, spine surgery, hand & shoulder surgery, gastro-intestinal disorder treatment, urology, abdominal surgery, colorectal surgery, and obstetrics & gynaecology. We provide one of the best medical check ups in Bangkok and we work hard to provide you with the best care. The finest health care is ensured by the hundreds of skilled surgeons and specialists that works at the hospital, most of whom benefit from years of service with international training and certification. Vejthani Hospital has received one of the highest numbers of Clinical Care Program Certifications (CCPCs) from Joint Commission International (JCI), USA that accredits the top-tier hospitals with highest patient safety. Vejthani Hospital’s clinical care programs for Diabetes Type II, Hepatitis B, Knee Replacement, and Lumbar Decompression and Fixation have received JCI CCPC. Two of them in the field of orthopedics makes a popular patients’ claim that the hospital is ‘The King of Bones’ plausible. Vejthani Hospital is the first hospital in the world to receive Hepatitis B CCPC and the first in Southeast Asia to receive Lumbar Decompression and Fixation CCPC. Contact us for the Bangkok hospital medical check up package to make the most of our abilities at Vejithani Hospital. 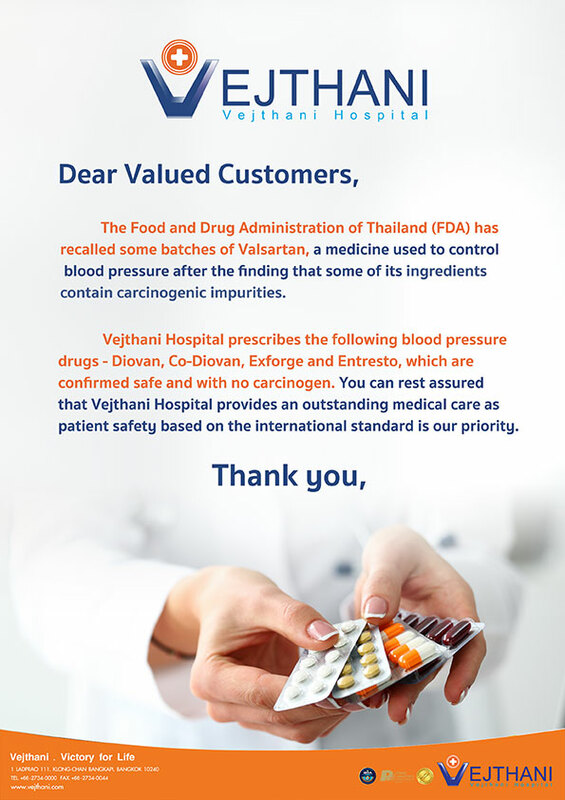 Over the years, Vejthani hospital has been receiving very positive feedback from our customers. 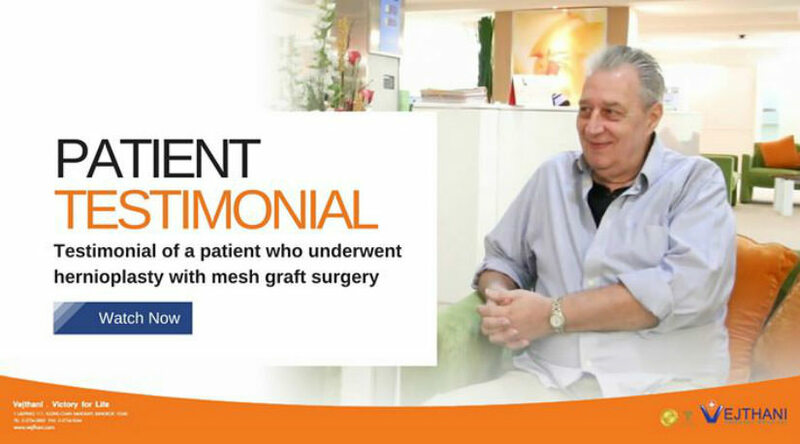 Mr. Hans Jurgen Schmitz underwent Open Hernioplasty with Mesh Graft Surgery at Vejthani Hospital. Find out what he thinks of our treatment, surgeon and medical services! Looking for an affordable, convenient and reliable hospital in Thailand? Please take a moment to watch the patients at Vejthani Hospital share their stories of health care they received from our top specialists and staff. Mr. Daniel Cliut Tauntou, an Australian patient went through Hair Transplant Surgery at Vejthani Hospital. He describes it as “really really well on all levels” to Dr. Chanika Witoonchart (Skin Laser & Cosmetic Center) and Dr. Athasit Amornthanomchoke (Vejthani Q-Life Center). The Women’s Health Center at Vejthani Hospital provides thorough medical consultation and treatment of Ob/Gyn’s diseases by highly skilled specialists. Vejthani Hospital Orthopedics Center is one of the best orthopedics groups in Bangkok specializing in the care of the musculoskeletal system. At Vejthani, hospital in Bangkok,Thailand. We provide health programs to suit your healthcare needs. To be recognized as a comprehensive medical service provider and one of the leading hospitals in Thailand. We proud to deliver high quality of services. That bring out the best to all patient, family and community. We provide exceptional and innovative care through the finest integration of clinical care and medical knowledge, while respecting the needs of the human spirit.